Th!nk! Can This Eco-friendly Car Start an Electronic Revolution? For pint-size designs, these electric cars seem to dream of a global revolution where many fear to tread, or have tried with not very impressive results. And think about it, these cars are 100% recyclable! But Th!nk Global, yes, think with an exclamation mark, a Norwegian company buoyed by undisclosed funding injection by Silicon Valley venture capital firms, Kleiner Perkins Caufield & Byers and RockPort Capital Partners, is rolling out the Ox, Open and City in North America within three years after a gallant start in Europe and I can’t stop to think when they’ll ever get to Africa. Think cars are gas-free, city cars that will start selling in the US next year but the actual mass roll out is slated for sometime in 2011, and the company has recently opened its North American division to steer the promising mad drive from the gas pumps. Which, I think, is good news for those who feel fuel prices are already over the top, with more pump shocks yet to come if the global crude price projection is anything to go by? Think, with more than 17 years of experience in developing and producing electric vehicles, designs, develops, manufactures and markets environmentally friendly vehicles and technologies. There are about 1,200 Think concept vehicles driving on European, mostly Norwegian, roads today. Think City is one of two models that are out already, together with the Think Ox. With a choice of either lithium or a sodium battery, it is gratifying that it can run up to 180 kilometers at 100km/hr without needing a recharge – enough to take a suburban dweller to the downtown office and back, with more miles to the theme park on a Friday afternoon without minding your carbon footprint. The lithium-ion batteries have capacity to charge to 80% capacity in less than an hour, and slender solar panels integrated into the roof power the dashboard electronics. Vicki Northrup, operations manager of Think North America says you can entirely recycle these revolutionary cars, from the dashboard to the fabric, unpainted body panels (to eliminate hazardous toxins), supports, air ducts, adhesives and fixings. If you reckon the battery is a little rusty, no problem. Simply return it to the supplier for a replacement. 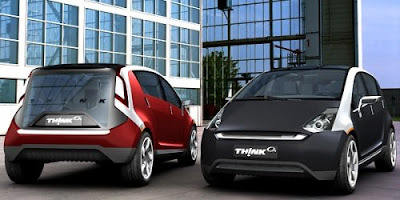 The Think Ox is the company’s latest concept development and the first designated 5-seater fully electric vehicle. Think Ox is projected to be 100% emission free, and includes a unique EV platform suitable for a variety of different body styles designed for the European, North American and Asian markets. According to Northrup, it is the basis for a variety of vehicle styles, starting with the Think Ox Crossover 5-seater. Talking of styles, the Th!nk designs are far away from anything ever created and other electronic wannabes look very, very pale in comparison. For the busy green businessperson, the Think Ox looks like the perfect companion on the road. It is fully computerized and allows a key-less entry. It features real time navigation, web, e-mail and open source interfaces, intelligent and sustainable driving and route calculations. The DNA-key gives the user feedback on charging status and sends messages, for example, for pre-heat or pre-cool options via GPRS. This is a car of high dreams - drivers who are wont to car sharing will never mind about taking up the lion’s share of the fuel cost - the batteries eliminate the unnecessary haggling about which family fills up the tank on the second week of July!